Gharbani, P., Mehrizad, A. (2012). The Effect of pH on Nanosized ZnO Catalyzed Degradation of 4-Chloro-2-Nitrophenol via Ozonation. International Journal of Nanoscience and Nanotechnology, 8(2), 121-126. P. Gharbani; A. Mehrizad. "The Effect of pH on Nanosized ZnO Catalyzed Degradation of 4-Chloro-2-Nitrophenol via Ozonation". International Journal of Nanoscience and Nanotechnology, 8, 2, 2012, 121-126. Gharbani, P., Mehrizad, A. (2012). 'The Effect of pH on Nanosized ZnO Catalyzed Degradation of 4-Chloro-2-Nitrophenol via Ozonation', International Journal of Nanoscience and Nanotechnology, 8(2), pp. 121-126. Gharbani, P., Mehrizad, A. The Effect of pH on Nanosized ZnO Catalyzed Degradation of 4-Chloro-2-Nitrophenol via Ozonation. 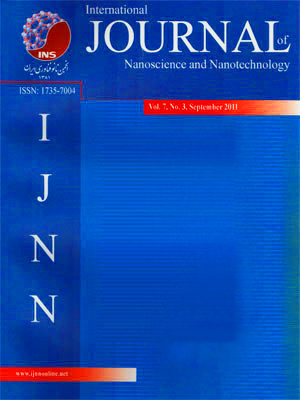 International Journal of Nanoscience and Nanotechnology, 2012; 8(2): 121-126. This research evaluates the efficiency of nanosized ZnO in the catalytic ozonation of 4-chloro-2-nitrophenol and determines the effect of pH on heterogeneous catalytic ozonation. The combined use of ozone and ZnO catalyst leads to conversion of 98% 4-chloro-2-nitrophenol during 5 min. In addition, it was found that in ZnO catalytic ozonation, the degradation efficiency of 4-chloro-2-nitrophenol was higher at low pH conditions (pH 3.0) than higher pH (pH 7–9). This result was not agreed in the case of ozonation alone, following which higher pH had positive effect on the degradation of 4-chloro-2-nitrophenol. At pH=3, the amount of total organic carbon was 54%. In the degradation of 4-chloro-2-nitrophenol by catalytic ozonation, the high reaction rate constant was obtained in acidic solution.